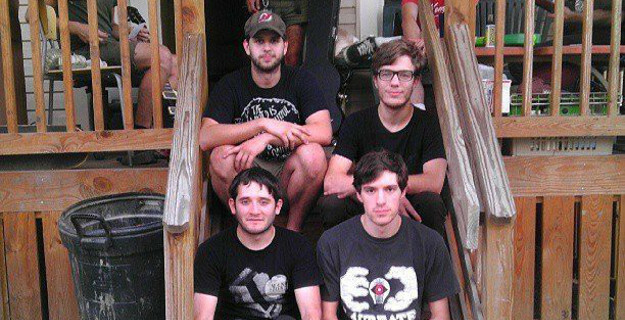 Pennsylvania’s Reservoir are a band of four (Justin + Andrew + Joshua + Steven) that play soaring post-rock emo punk that's both noisy (think: crunchy riffs) and pretty (think: twinkling noodles). Please note that I am predisposed to loving these guys as noisy + pretty is in my DNA. If you suffer gladly from a similar condition, allow me to slide over and make room for you on the goodness train. You know why I love soaring post-rock emo punk like this? I'll tell you, buddy. Because this stuff gets me pumped to go out and do good things with my life... tackle the world.... see about righting some wrongs and living out the rest of my days knowing I made a difference. And I'm going to do all that.... right after I finish listening to Reservoir... I can't stop just after a few plays... and then of course I'll have to shower... after that it will be practically noon.... and that's probably too late in the day to start doing good things... better wait for tomorrow…. tomorrow things will be different. Anyway, what was I saying? I don't remember. But yeah, if you like any of those old ‘90s bands that rocked a similar sound vibe that Reservoir slings (like, I don't know, Cap’n Jazz Christie Front Drive Mineral Sunny Day American Football Jawbreaker Knapsack + whoever you think) you should consider getting into these guys. And I should consider minding my own business. Reservoir has several releases available for your perusal on the World Wide Intrasphere. Please enjoy them all. But their newest is a 4-song EP called “Cicurina Volume 1” that comes from Seattle label Glory Kid. It just might be their best. But who's to say about such things. Who's to say. You are. You're to say. Here’s a good song from it. Play it real quick. It’s cool. I’ll wait. You see? I told you it was good.